THE APPOINTMENT OF Joe McHugh as Minister of State responsible for the Gaeltacht was met with some criticism last summer. It emerged (pretty quickly) that the Donegal TD wasn’t fluent in Irish. It’s not like he was just ‘rusty’ either. The Fine Gael politician has admitted his language skills were “ar an úrlár” (on the floor). McHugh has gained praise for his decision to immerse himself in the language over the last 12 months or so, and his confidence has grown to the extent that he’s now giving lengthy live interviews As Gaeilge. But that’s not to say everyone’s happy with the coalition’s approach to the issue: Taoiseach Enda Kenny came in for criticism for comments to a crew producing a documentary about McHugh’s efforts to learn the language earlier this summer. 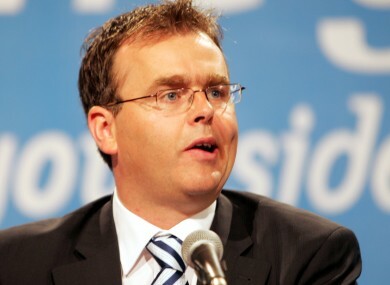 The Fine Gael leader said figures showed use of Irish was “actually increasing – by a small percentage – but increasing”. The president of language rights group Conradh na Gaeilge, referring to a report published earlier this year, said Kenny was clearly mistaken. Speaking to TheJournal.ie (As Bearla – by our choice) by phone from his latest stint in Irish college this week, McHugh said a report last year estimating there were fewer than 1,000 children who are native Irish speakers in Gaeltacht area primary schools showed there were cleary “challenges”. The ESRI report in question, published at the start of this month, showed positivity towards Irish had grown from 49% to 67% in the Republic over a twelve year period. However, despite the improvement in attitude it found Irish was still not spoken frequently outside of the classroom. 75% of people with basic fluency who responded to the survey the report was based on said that their peer group did not speak Irish, with almost half of those with advanced fluency saying the same. “The way we’ve been doing things in relation to the language, we have to change them. We have to promote the journey aspect – that it’s a journey from the day you’re born till the day you die,” McHugh said. His classmates at the Oideas Gael college in Gleann Cholm Cille this week included a man from California with “no Irish connections” brushing up on his grammar, McHugh said. One of his teachers was a man from New York who started learning Irish twenty years ago. Asked how he felt to be learning Irish from a non-native speaker, McHugh said it was “just incredible, and an incredible inspiration”. “This is it, you see – this is the story. “He’s proving it can be done – and as far as he’s concerned and the other Americans that I’ve met over the last 12 months, they feel part of the Irish Gaeltacht community – even though they might be living in Montreal or Nova Scotia. “We need to have a very open conversation as to what the concept of the Gaeltacht is. Email “"An incredible inspiration": Gaeltacht minister Joe McHugh on learning Irish from a New Yorker”. Feedback on “"An incredible inspiration": Gaeltacht minister Joe McHugh on learning Irish from a New Yorker”.